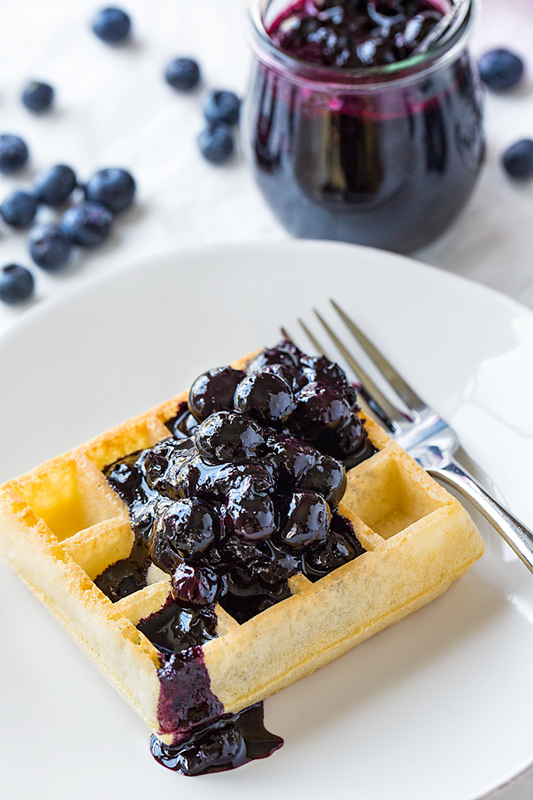 Deliciously sweet and tangy, this blueberry compote made with all-natural, fresh ingredients is the perfect topping for your pancakes, waffles, French toast, and ice cream! 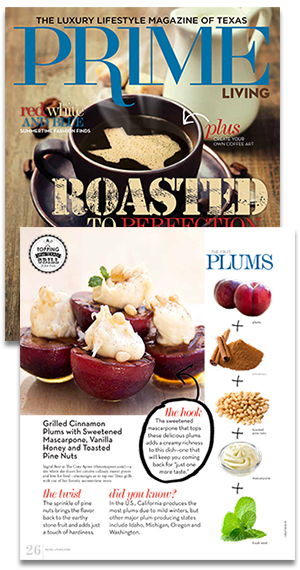 When Life Gives You Blueberries… Make Blueberry Compote! Every couple of months or so, my hubby and I get a craving for one of our “pancake nights”—special occasions when we tag-team and prepare pancakes as well as some of our other breakfast-y faves for a cozy Saturday evening dinner. This has been a tradition in our household for years now, and they’re one of our favorite ways to celebrate Saturday night! In the fall, I’ll typically prepare these fluffy apple flapjacks because they’re a bit spicy-sweet and a perfect way to use up all the seasonal apples we have around. But in these more sunny months, when the blueberries are juicy, sweet and plentiful, I like to prepare pancakes with a fresh blueberry compote, served nice and warm, to spoon generously over top. Blueberry compote is probably our favorite topping when it comes to pancakes, waffles, and French toast (I’ve made it as an accompaniment to this puffy French toast casserole many times); it’s so incredibly easy and delicious to make from scratch in your very own kitchen. 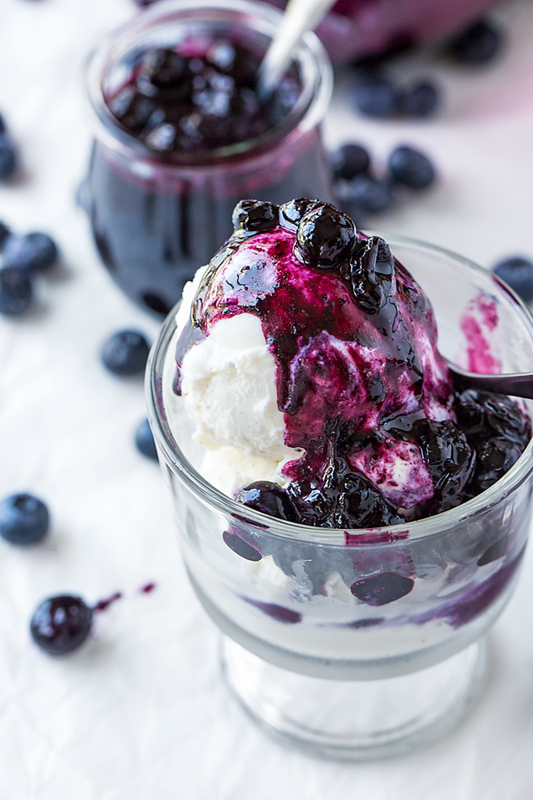 There are no artificial ingredients—no coloring, flavoring, or fake sweeteners—in this simple blueberry compote recipe. There’s just all-natural, juicy and delicious ingredients like lots of fresh blueberries, organic cane sugar, lemon zest and a touch of lemon juice. 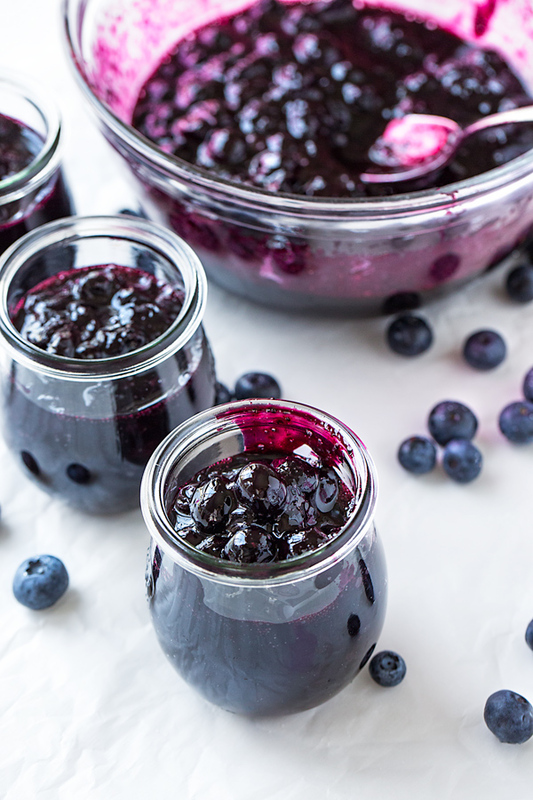 So when this amazing time of year comes around and your fridge is stocked with those delectable little blueberries, those lovely little blue “jewels”, add some sweetness to your life and prepare a homemade blueberry compote! Use it as an extra yummy topping for your own pancakes, waffles, and French toast (or ice cream, or swirled into yogurt, or spread on brioche, or… the list goes on and on!). One of the convenient things about preparing a homemade blueberry compote recipe is that you can use either fresh blueberries or frozen ones depending upon their availability. 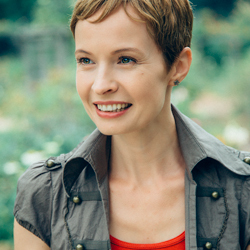 In the warmer months, I love to use fresh berries, because they are perfectly tangy and sweet, plump and juicy. But in those months when they’re harder to find fresh, using good quality organic frozen blueberries will work perfectly fine. Then, it’s just a matter of adding in a few other ingredients, and simmering things together until nice and thick and spoonable! I add one pound of washed, fresh blueberries (or frozen ones, if out of season) into a medium-size sauce pan or small pot. I stir in some lemon zest, a squeeze of lemon juice, some sugar, and just a touch of water, and bring the mixture to the boil. I allow the mixture to vigorously simmer or gently boil for about 8-10 minutes, just until the blueberries begin soften and burst a little, releasing their juice. Fresh or frozen berries: When fresh blueberries are sweet, tangy and in-season, I recommend you use those for the best flavor; but you can certainly substitute frozen berries for convenience sake, or when they’re not in season. Add a little lemon: Blueberries and lemon are best friends, so adding in just a little kiss of lemon zest and juice will brighten things up even more. You’ll taste a hint of lemon, but it won’t overpower. 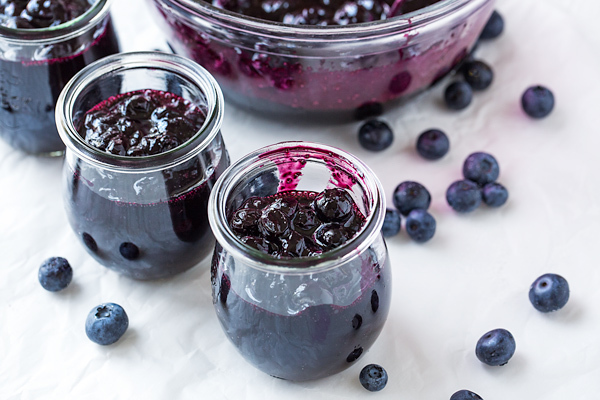 Sweeten things up: I prefer to use organic cane sugar in my blueberry compote because it is neutral in flavor; but you could substitute maple syrup, agave, or honey—these, however, will add some additional flavor you may not be looking for. 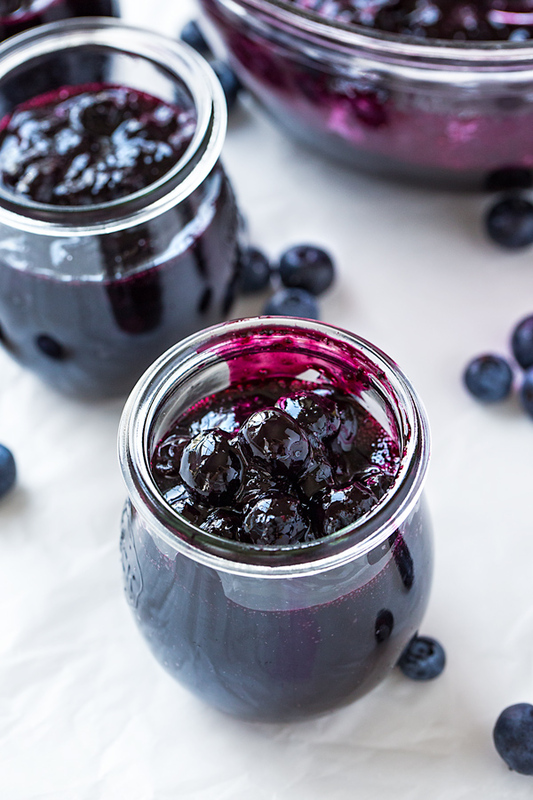 How to store: I keep my blueberry compote in a mason jar or covered container in the fridge for up to two weeks, and gently re-heat in the microwave or in a small sauce pan for use on pancakes, etc. 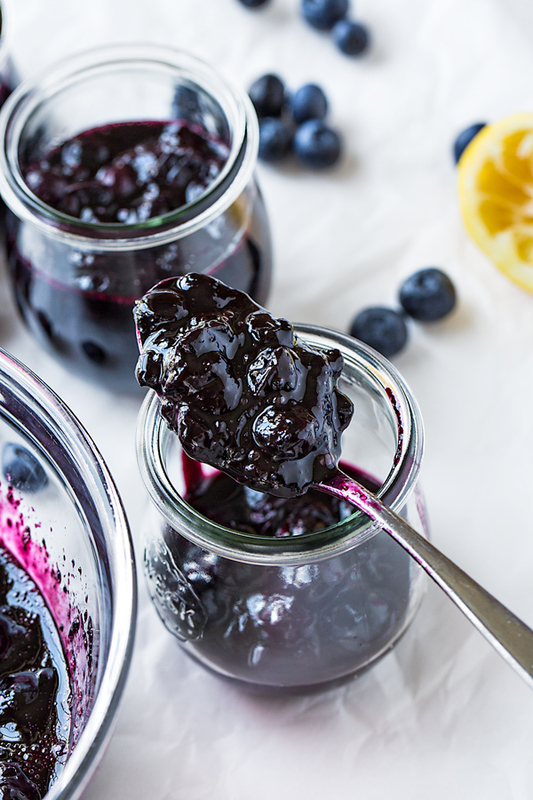 Naturally delicious, this fresh blueberry compote recipe kissed with lemon is perfect for pancakes, waffles, French toast, or as a topping on ice cream! –Add the 1 pound (16 ounces) of blueberries to a medium pot, along with the water, sugar, lemon zest and lemon juice, and stir to combine. –Bring the mixture to a vigorous simmer or medium boil, and cook for 8-10 minutes, stirring occasionally, until the berries pop and release their juices, and soften. 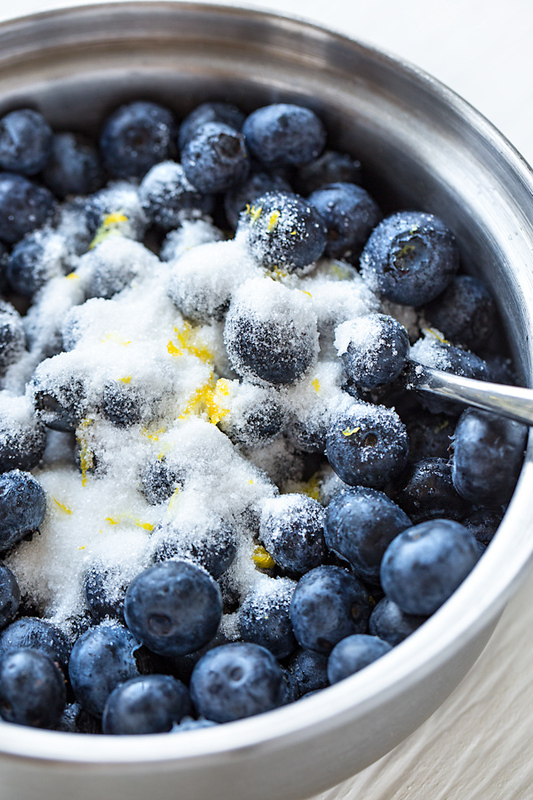 –Remove from heat and give a little taste to see if you need any extra sweetener or lemon juice, then add in the reserved 1/4 pound (or 3/4 cup) of fresh blueberries and stir those in. –Allow the blueberry compote to cool (I expedite the process by using my fridge), allowing the compote to thicken as it cools. –Spoon into jars or a covered container, and use as needed, either warm or cold. Have you ever tried to make it in a slow cooker? Hi Tina, I have not frozen this recipe, so I cannot tell you for sure if it will be as good as when freshly prepared. (I have a hunch that it’s one that is best fresh.) And as for the slow cooker, no I have not prepared it this way. It’s a very quick-cook recipe, only taking 8-10 minutes, and benefits from occasion stirring; so this is one more for the stove top in my opinion. I made this compote to pair with a cheesecake. It was amazing. The compote is so simple and it tastes so good. I used fresh blueberries and regular white sugar (which I had on hand) and I was really happy with the results. We’re going to have the rest on some pancakes this weekend. Kathy, that is wonderful! So glad to read that the recipe was a success, and I thank you for sharing! could I use this compote to put on french a french toast casserole before baking it, or should I do it after baking it? Hi Carolina, if you’d like to top your casserole with this compote, you certainly can; but top after baking, just before serving. I would actually suggest you serve it warm on the side and let folks top it themselves, so that it doesn’t get soggy, especially if you end up with leftovers.